The Sierra Range was formed about 500 million years ago when the Sierra Nevada lay below an ancient ocean. The ocean sediment was uplifted above sea level. When the uplift occurred, molten rock formed below the sediment forming a massive batholith that slowly cooled forming granite. Erosion by water and glacier eventually eroded nearly all of the ocean sediment away, exposing the granite below. Glaciers further eroded the granite forming the many valleys visible in the image, including the famous Yosemite Valley. The same structures pictured ten years apart. Mono Lake is the center of attention in the space shuttle image. This alkaline lake in the high desert of the Eastern Sierra is home for many life forms. This million-year-old inland sea is one of the oldest lakes in the world. The naturally saline waters mix with fresh water springs creating calcium carbonate (limestone) forming magnificent tufa towers that rise out of the shrinking lake. Mono Lake provides abundant food for migratory birds such as shorebirds, grebes, gulls, ducks, and geese. Microscopic algae are the food source for trillions of brine shrimp and alkali flies that thrive in the salty water. No fish can survive in this alkaline environment. At a pH level of about 10, the lake is about three times as salty as the ocean. In 1941, the Los Angeles Department of Water and Power (LADWP) began to divert water from the freshwater streams that feed the lake, in order to support the growing metropolitan's water needs. As a result, the lake fell 45 vertical feet, and it's salinity doubled, threatening the lake's fragile ecosystem. 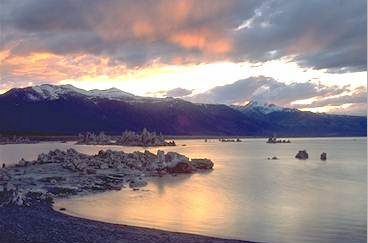 In 1994, the California State Water Resources Control Board voted to allow Mono Lake to rise from its current elevation of 6375 feet to 6392 feet above sea level. This law would limit LADWP's diversions from destroying Mono Lake. The area featured in the image to the left is a wonderland for tourists, scientists, artists, explorers, and anyone who can appreciate the natural beauty of the Sierra landscape. The Eastern Sierra Nevada is noticeable all along the center to left side of the image, as the flat snow-covered desert plain to the east of the dramatic altitide drop from the sierra mountain crest. Even though this region is between 5,000 and 7,000 feet above sea level, the area is predominantly desert because of the large rain shadow caused by the tall peaks along the Sierra Nevada. The rugged snow-covered landscape to the right of this desert region makes up the middle portion of the Sierra Nevada Mountain range. The crest of the range appears along the left side of the range, with tall peaks reaching 14,000 feet and more, with a dramatic drop to the left into the upper desert. To the right of the crest, the range slowly declines into the San Joaquin valley, the dark section featured at the right edge of the image. Yosemite Valley, also known as "The Incomparable Valley," is one of the world's best known examples of a glacier-carved valley. The valley has sheer cliffs reaching in some places over 3,000 feet high, and flat floors filled with sediment from the ongoing process of erosion. Yosemite Valley was formed when an alpine glacier filled in the canyon of the Merced River. The ice carved through the weaker sections of granite, plucking away chunks of rock as it moved to the west end of the valley, and leaving more solid portions of granite such as El Capitan and Cathedral Rocks. When the glacier began to melt, it left a terminal moraine that dammed the valley, creating ancient Lake Yosemite. Sediment eventually filled in the lake, forming the flat valley floor that exists today. 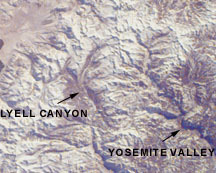 The eastern portion of the valley is the Merced River canyon, with the typical V-shaped river cut canyon. The glacier did not extend this far back. Back from the rim of the valley are some slopes showing glacial polish, but for the most part these areas were not glaciated. 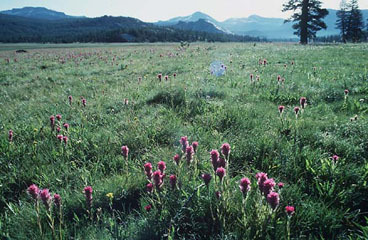 The flat valley floor contains many open meadows with wildflowers and flowering shrubs, oak woodlands, and mixed-conifer forests of Ponderosa Pine, Incense Cedar, and Douglas Fir. Wildlife from monarch butterflies to mule deer and black bears exist in this bountiful environment. Over the sheer cliffs flow spectacular waterfalls, which reach their maximum flow in May and June. Yosemite, Bridal Veil, Vernal, Nevada, and Illilouette are the largest of these falls. Glacier Point, on the southern rim of the valley, has probably the most spectacular view of the entire valley and the High Sierra. About 3,200 feet below your feet is the valley floor. Across the valley are the two tiers of the Yosemite falls, plunging 2,425 feet to the valley floor. 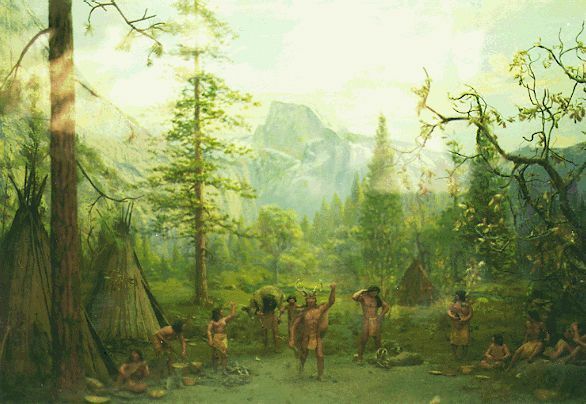 Native American Indians lived in the Yosemite Valley for some 4,000 years. The Indians who lived in Yosemite Valley were known as the Ahwanee (a smaller group of Miwok Indians) and had established permanent villages near the Merced River as well as all over the valley. These people were hunters and traders as well as seed and plant gatherers. There is some evidence of a fatal plague that struck these people at the beginning of the 18th century. 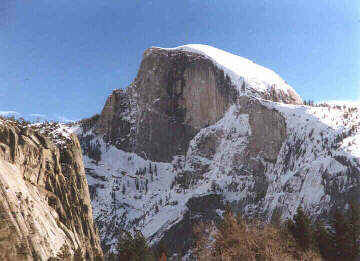 The survivors were said to have left Yosemite and moved to the Eastern Sierra where they assimilated with other tribes. One of the offspring of the Ahwanee, named Tenaya, heard stories of a beautiful valley and went to visit the homeland of his people. The stories of beauty and bounty of the valley were all true, and he and some 300 Indians resettled here where he became chief. When the Goldrush brought white settlers into the valley, feuds broke out. Following the death of Chief Tenaya in 1853, the remaining Indians left the valley, and it then became a white man's settlement. The first non-Indian to discover the Valley was Joseph Rutherford Walker in 1833. Word soon spread of the grandeur of the valley, which could be read in San Francisco newspapers. The first group of tourists led by James Mason Hutchings entered the valley in 1855. Hutchings operated the first hotel and became Yosemite's first publicist and entrepreneur. Soon after, a cry to preserve Yosemite was made and I.W. Raymond petitioned Congress for a bill to preserve Yosemite. President Abraham Lincoln passed the bill on June 30, 1864. This was a landmark event because no government had ever set aside a parcel of land to be preserved for public use at all times. Finally, naturalist John Muir led an effort to create Yosemite National Park in 1890. 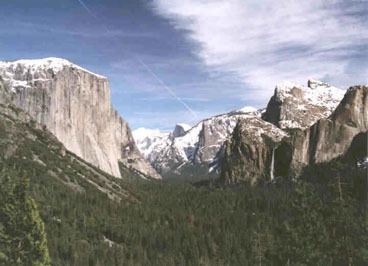 Yosemite contains some of the world's most recognized landscapes and landforms. Steep granite sides enclose this perfect U-shaped valley called Yosemite Valley, with some of the world's tallest and most beautiful waterfalls pouring over the sides. The higher elevations experience glaciated peaks and beautiful meadows that bloom in the summer. Backcountry trails entice nature-lovers to experience Yosemite where civilization doesn't exist, where there is some of the most pristine countryside in the United States. 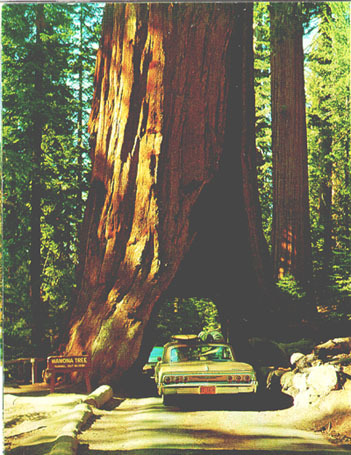 Giant Sequoia trees that reach heights of 200-300 feet have trunks wide enough for a car to drive through. All of these wonders have been appreciated by man for thousands of years, and can continue to be experienced within the Yosemite National Park. Mammoth Mountain is just south of Mono Lake, along the Sierra Nevada Faults. The Eastern Sierras and Mammoth Mountain are well known for their infinite supply of recreational activity throughout the year. Excellent skiing, backpacking, boating, climbing, off-road driving, hot spring swimming, hiking, fishing and camping can all be accomplished in this fantastic natural playground. However, the forces that created this beautiful place are still active, and are constantly changing the landscape. Persistent seismic and volcanic activity over the last four million years has formed the spectacular Eastern Sierra landscape in the Long Valley Caldera and Mono Basin. The Glass Mountain volcanic eruptions about 760,000 years ago climaxed with a catacylsmic eruption of 600 cubic kilometers of rock and ash, causing a two to three kilometer depression of the magma chamber roof beneath the surface to form the present 17 by 32 kilometer oval shaped Long Valley Caldera. 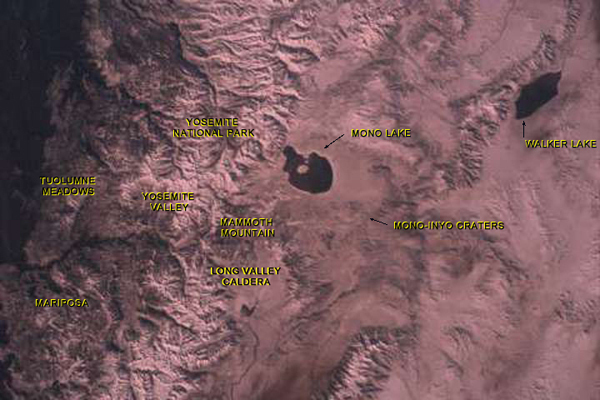 The Mono-Inyo craters make up the youngest volcanic chain along the Eastern Sierra. This system of craters was created by a fissure system that extends from south of Mammoth Mountain through the western portion of the caldera to the north shore of Mono Lake. Repeated eruptions of dacite and rhyolite on the southwest rim of the caldera formed Mammoth Mountain, a cumulo-volcano. The Mono Craters were formed by multiple eruptions of high-silica rhyolite as recently as 600 years ago. The Inyo Craters were formed by eruptions of low-silica rhyolite as recently as 500 years ago. The most recent eruption occurred at Paoha Island in the middle of Mono Lake 250 years ago. Eruptions tend to occur along this chain every 250 to 700 years. Since 1980, a substantial amount of geologic unrest within the Long Valley Caldera and Mammoth Mountain. In May 1980, four earthquakes of magnitude six (three of which struck in the same day) awakened the caldera. As a result, a dome-like uplift occurred in the caldera, raising the floor almost a foot. Ongoing swarms of earthquakes have induced the continued swelling of the region, causing the area to rise nearly two feet over 100 square miles of land, signifying that new magma is rising beneath the surface. A dead forest at Mammoth Mountain. During the early 1990's, trees began dying off at several places on Mammoth Mountain. Studies by USGS have discovered that the trees are dying due to an excess of CO2 in the ground. In the late 1980's, geologists detected many small earthquakes beneath Mammoth Mountain, causing a small body of magma to rise through a fissure beneath the Mountain which prompted the release of volcanic gas. The excess amount of CO2 in the soil interfers with other nutrients vital to plant survival. CO2 is heavier than air, and seepage above the soil will loom over the ground, collecting in snow banks, depressions, and poorly ventilated enclosures, posing a threat to people as well as the environment. The area of dead and dying trees has covered more than 100 acres. Increased CO2 gas release and increased seismic activity are all signs of an imminent eruption. Considering the volcanic history of the area, eruptions will likely continue to occur, it is only a matter of when. Redwood trees wider than cars can be found in the Mariposa Grove. The Mariposa Grove, 30 miles south of Yosemite Valley, is the largest of the three Sequoia groves in Yosemite. The Tuolumne and Merced Groves are north of the Valley. Redwood trees are one of the oldest living life forms on Earth, and are the largest living life form in the world. During the last 100 years, protection of these trees has been both insufficient in some places, and excessive in others. For example, in the late 1800's, tunnels were cut through two trees in the Mariposa Grove. Conversely, measures were made to prevent forest fires with the intention of preserving the trees. Yet this actually had an adverse effect on Redwood reproduction. Because the bark of Redwoods does not contain any resin to burn, these tree are already remarkably resistant to fire. The Redwood's tiny seeds require sunlight and a small amount of soil for germination. Frequent natural forest fires open the forest floor by thinning out plant species and debris, leaving rich mineral soil for the seedlings to grow. However, years of fire prevention have stifled the reproduction of these trees. In the early summer, the Tuolumne Meadows are painted with vibrant flowers, such as buttercups and blue bells. This picture of the Tuolumne River was taken in the late summer, when the colorful meadow turned to lush green grassland, and the river flow is at it's peak. Even during the summer climate, the mountain tops still remain covered in snow. The high country in summer contains flowering meadows, lakes, exposed granite slopes, domes and tall peaks all teeming with life. Since the winters are so long at these elevations, the growing season is on average only two to three months in the year, so plants and animals take maximum advantage of the warm days to grow, reproduce and store food for the long, cold winter ahead. 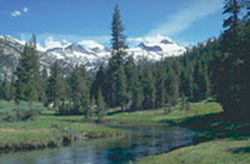 Tuolumne Meadows, at 8,600 feet, is the largest sub-alpine meadow in the Sierra. 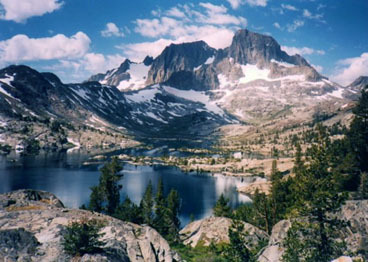 Many of the backcountry trails begin in this area, such as the John Muir trail. Many people throughout the year backpack over harsh terrain to capture the hidden treasures of the Sierra Nevada. Backcountry trails allow the adventurer and outdoorsman to experience the true undeveloped and untarnished beauty of Yosemite. Many trails, such as the John Muir Trail, allow hikers to travel from Tuolumne Meadows all the way to Mount Whitney (the tallest peak in the Continental United States), or from Mammoth Mountain to Yosemite Valley, and many other places. The paths of many trails can be tracked from the Space Shuttle image. The Lyell Canyon and Yosemite Valley contain major trails that guide travelers through the vast expanse of wilderness and mountains. If you look closely at the image, you can see mountain passes where there are likely to be routes to popular places such as Mammoth and Yosemite Valley. Most of the lakes and rivers featured in the Space Shuttle image are used specifically to supply water for the metropolitans of California. Each lake that has been dammed has a river flowing from it that meanders its way towards the California Aqueduct. The plentiful snow and rain that strikes the High Sierra is essential for the agricultural economy of California, and for the millions of people who live in major cities such as San Francisco and Los Angeles. Without this water supply, California would undoubtedly suffer from drastic water shortages. Hetch Hetchy Reservoir (pictured above) has been the primary water supply for San Francisco since the dam was built in 1923. Before the dam, the Hetch Hetchy Valley was much like the Yosemite Valley. The Tuolumne River flowed through glorious meadows in a beautiful, glacier-carved valley with steep, sheer granite cliffs. Many historians say that Hetch Hechy's beauty puts Yosemite Valley to shame, and there is a large movement to remove the dam and restore the Hetch Hetchy Valley. However, the city of San Francisco has legal custody of the land for 100 years to support San Francisco's water needs. At its dedication in July 1923, the O'Shaughnessy Dam was proclaimed the largest single structure on the west coast. Its current height is 430 feet, and it spans 900 feet at the crest across the Tuolumne River. 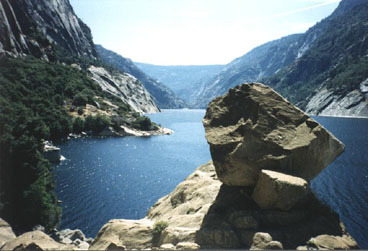 The Hetch Hetchy Reservoir holds 360,000 feet of water. 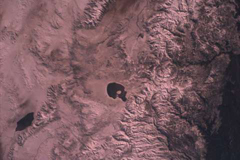 Owens Lake is the starting point of the Owens River. In recent geologic time, water flowed to the south through a series of lakes, eventually reaching Death Valley. 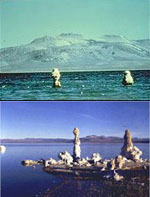 However, as glaciers receded in the High Sierra, the level of the lake dropped below the outlet and Owens Lake became a highly saline natural sump, much like Mono Lake. Before 1913, Owens Lake lost about 98 billion gallons of water per year by evaporation alone. In 1913, LADWP decided to use the Owens Lake by building a dam and diverting the water into the California Aqueduct to support Los Angeles.